Using state-of-the-art techniques scientists have dated cave paintings at 11 locations in north Spain, including the Unesco World Heritage sites of Altamira, El Castillo and Tito Bustillo. Samples from 50 paintings of different styles were collected and the scientists discovered that a red disc on the wall of the El Castillo cave had to be more than 40,800 years old. "This is currently Europe's oldest-dated art, by at least 4,000 years," said Alistair Pike, of the University of Bristol, who led the research. "We know the modern humans arrived in Europe between 42,000 and 41,000 years ago." 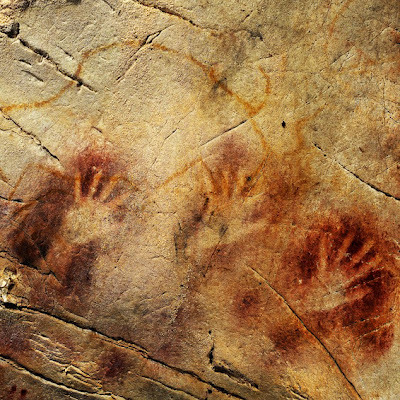 Nearby hand stencils, formed by blowing paint against a hand pressed against a cave wall, were at least 37,300 years old. The results are published on Thursday in the journal Science. Accumulating evidence is rapidly changing our view of our cousins, homo sapiens neanderthalensis, as we consider the skilful stone tools they made, their survival under harsh environmental conditions of the last Ice Age, and now their artistic ability. Perhaps also some of the figurines and early flutes attributed to our ancestors, homo sapiens sapiens, were actually made by Neanderthals! It is natural for homo sapiens sapiens species to praise the Lord. The birds praise the Lord when sun rises in the morning. Surely, also homo sapiens neanderthalensis people praised the Lord in their very own way and languages! It is therefore appropriate to remember the first Neanderthal man, Joachim Neander, and how wonderfully he invites us all to praise God, the Creator of everything, including us and them. Joachim Neander (Neumann) was a German Reformed (Calvinist) Church teacher, theologian and hymn writer whose most famous hymn, Praise to the Lord, the Almighty, the King of Creation (German: 'Lobe den Herren, den mächtigen König der Ehren') is generally regarded as one of the greatest hymns of praise of the Christian church and, since being translated into English by Catherine Winkworth in the 19th century, it has appeared in most major hymnals. Joachim Neander was born in Bremen, the son of a Latin teacher. His grandfather, a musician, had changed the family name from the original Neumann ('New man' in English) to the Greek form Neander following the fashion of the time. 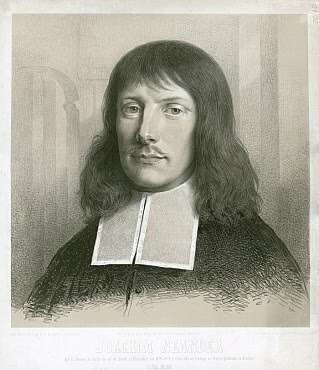 In 1679, Neander became a pastor in Bremen, as his popularity with the common people had caused problems with the church administration in Düsseldorf. on May 5 1680, at the age of 30, he died in Bremen of tuberculosis. Neanderthal man praising the Lord! Den mächtigen König der Ehren!